Cast members of the NYA Award winning ensemble of HOW TO SUCCEED IN BUSINESS WITHOUT REALLY TRYING get a free ticket to the awards, so come out and support Emerson and Evan as they perform “Love From A Heart of Gold” ! The National Youth Arts awards ceremony will be held at Mt. Carmel High School in San Diego (Rancho Penasquitos, right off the 56 Fwy) at 7:30 p.m. (registration beginning at 6:45 p.m.) on Monday, July 14. See the RSVP link below. Award winners, including all cast members of Ensemble awards, will be invited up to the stage for the presentation of the award. Anyone who wants to attend and all performers will need to RSVP so that we know if they will be there and how many people will be attending. There is an RSVP form located at http://www.nationalyouththeatre.com/news/news_nya_awards2014_rsvp.asp. Award winners and nominees get 1 free ticket for themselves (as do participants of an Outstanding Ensemble or Production award). Additional tickets are $15/each. 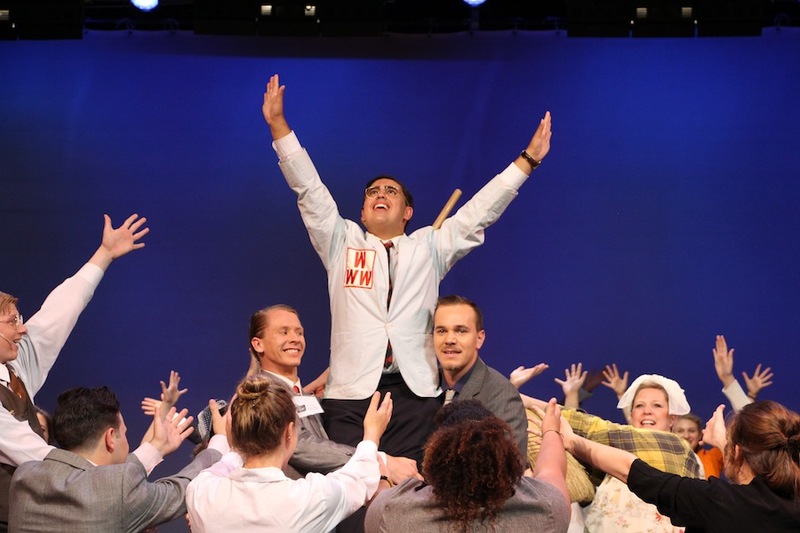 HOW TO SUCCEED Was A Success! The 9th grade Intermediate Theatre students will travel to Hope, Poinsettia and Magnolia Elementary schools with their play “The Adventures of Peter Rabbit and His Friends” on January 10, 14 and 16. The PreAdvanced/Intermediate Theatre class presents three chilling one-act plays, “Sorry, Wrong Number”, “Overtones”, and “The Lottery” on Monday, January 13, at 7:00 P.M. in the Cultural Arts Center. Admission is free with ASB sticker, or $5.00 at the door. The Advanced Theatre students present Mary Zimmerman’s Metamorphoses on Friday, January 17 and Saturday, January 18 at 7:00 P.M. in the Cultural Arts Center. Admission is free with ASB sticker, or $5.00 at the door.